After a month-long construction phase, Clearwater’s Winter Wonderland will open December 1st when Santa will turn on 100,000 lights for 3 weeks of family fun. 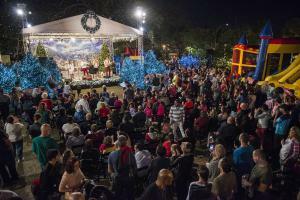 CLEARWATER, FLORIDA, USA, October 24, 2018 /EINPresswire.com/ — On November 3rd, the Clearwater Community Volunteers (CCV) will start construction in preparation for the 26th Annual Winter Wonderland opening on December 1st at the Osceola Courtyard, corner of Drew Street and N. Fort Harrison Avenue, in downtown Clearwater. Winter Wonderland is sponsored by CCV and the Church of Scientology Flag Service Organization. At Winter Wonderland’s December 1st grand opening Santa will plug in the 100,000 twinkling lights of the 77 live Christmas trees in his village to kick off the 3-week Holiday festival for thousands of children and families. Dozens of volunteers will spend close to 2000 hours constructing the winter-themed village. Clearwater’s Winter Wonderland is also a food and toy drive for needy children and families. Visitors are asked to bring an unwrapped toy or non-perishable food item and put it in Santa’s sleigh. All of the donations will be given to the Pinellas Sheriff’s Police Athletic League to help families over the holidays. Clearwater Community Volunteers (CCV) is a non-profit, charitable organization made up entirely of volunteers and was founded by parishioners of the Church of Scientology in Clearwater. CCV produces the “Ginormous Easter Egg Hunt” in Coachman Park in Clearwater every spring, Fashions with Flair fundraiser fashion show at the Fort Harrison and Winter Wonderland. CCV gets its inspiration from Scientology Founder L. Ron Hubbard’s article, “Love and Help Children” in his book The Way to Happiness. CCV has raised hundreds of thousands of dollars over the past 25 years for charities such as Nourish to Flourish, Shriners Hospitals for Children Tampa, Boys and Girls Club of the Suncoast, Homeless Empowerment Program, the Make-A-Wish Foundation, the Police Athletic League and The Children's Home, Inc., the oldest orphanage in Tampa.